I recently purchased an Epson 3880 printer for digital black and white printing to replace my Epson 2200. The older printer consistently produced a notorious green cast no matter how often I calibrated or what ICC profile I used. Many prints showed metamerism or bronzing. 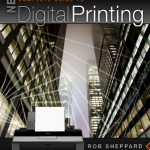 When I received Rob Sheppard’s book, New Epson Complete Guide to Digital Printing (published in 2008), I decided to set up my printer with Sheppard’s methods. This book is aimed at the Epson consumer and while most of the information is applicable for most Epson printers, the printer photographs and detailed screen shots are of Epson’s newer models (3880, 7880. 9880, etc.). This book was originally published in 2003 and revised twice. Due to the advances in Epson printing technology, software, and cameras, Sheppard stated he had to literally rewrite the information in the book to make it relevant for today’s photographer. I appreciate the fact that the book begins by discussing the craft and aesthetics of the print and what constitutes a good vs. bad print, plus the benefits of making a work print. 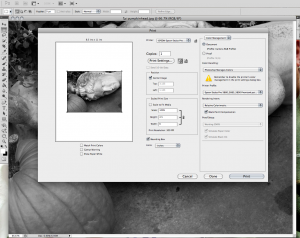 That is reminiscent of darkroom workflow and is crucial for creating a successful print. I agree with his view that if photographers are investing in high end printers, then they need to familiarize themselves with the paper, profiles, mechanics, and maintenance of the printer. He goes on to discuss basic printing workflow, color management, print drivers, resolution, and Photoshop corrections and adjustments. For experienced photographers, this information may a bit too basic but I found the review to be a good refresher. Chapter 6 is about “Prepping the Image for Printing” and is an excellent primer for any photographer’s digital workflow. Local adjustments, whites, blacks, and evaluating the work print are highlighted in this chapter with a sample work print based on Sheppard’s evaluative criteria. Regarding soft proofing, the author is not a fan as he feels it can be misleading as it leads the user to believe that matching the monitor will make a successful print. The remaining chapters cover sharpening, digital artifacts, different paper and media, black and white prints including toning, and panoramic printing. The final chapter is concerned with printer maintenance and troubleshooting. Interspersed throughout New Epson Complete Guide to Digital Printing is work by well-known digital photographers who use Epson printers: John Paul Caponigro, Jack Reznicki, and Bruce Dale. Sheppard was editor for Outdoor Photographer and founding editor of PCPhoto magazine and it shows in his writing as this is a carefully thought out and well written book. I anticipate that this title will need to be revised in the next several years because he is using references to Photoshop CS3. It would be nice to have some tips or troubleshooting advice printing on the various specialty Epson papers as well as photos and set up of the advanced printing options for black and white. I used my manual for black and white printing as it was more comprehensive than this book. So how did I succeed with this book in conjunction with my Epson set up guide? I found that refreshing my printing vocabulary, using Epson’s Advanced Black and White Photo Mode, and really making a work print for serious editing decisions were all helpful. No more odious green casts when I print on matte paper nor bronzing of color or black and white prints. For anyone who owns or is planning to own one of the high-end Epson printers, I think this book is an invaluable reference guide. The information, hints, tips, and terminology are quickly accessible. Some potential readers may find the information a bit basic, especially if they have been printing with Epson’s for a long time, so I would recommend this book for beginning to intermediate photographers who use Epson printers. A very thoughtful and intelligent review and as an owner of an Epson Printer, very much appreciated. Thank you.